As we all know, Hugo Chávez [en], president of Venezuela, died [en] on March 5. But what we are perhaps less familiar with is the relationship between Chávez and Peru. It began in 1974 when Chávez arrived in the country [en] as a young cadet and part of the Venezuelan military delegation come to celebrate the 150th anniversary of the Battle of Ayacucho [en], which secured the independence of Peru. It is likely that this event inspired Chavez's admiration for General Juan Velasco Alvarado [en], the erstwhile President of Peru and architect of the so-called Revolutionary Government of the Armed Forces. Later, in 1992, President Fujimori gave asylum to 93 members of the Venezuelan military, followers of Chávez, who had mounted a failed coup [en] against Carlos Andrés Pérez [en]. The next noteworthy event in this relationship took place in 2000, when it was rumoured [en] that the Chávez regime (he was now president) had provided protection to the fugitive Vladimiro Montesinos [en], a close advisor to then Peruvian president Alberto Fujimori [en]. Hugo Chávez also had a cameo in the Peruvian presidential elections of 2006 [en], where his support [en] for the candidate Ollanta Humala was the country's worst-kept secret. Humala lost the campaign; so when he ran again and won the elections of 2011 [en], he avoided overt ties to Chávez. In 2006, Casas del Alba were established in Peru. Officially an organization offering humanitarian assistance, it has nevertheless been investigated on several occasions because of accusations that it functions as a front for interference and meddling by proponents of “chavismo”. 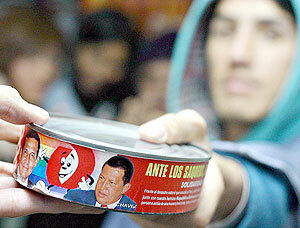 Another incident that provoked speculation occurred when cans of fish turned up bearing labels with photos of Humala and Chávez, apparently as part of an aid package sent to the victims of the 2007 earthquake in Pisco [en]. But Chávez's interest in the victims was not confined to foodstuffs, he also donated 100 new homes in a housing project, christened Simon Bolivar, in the badly damaged town of Chincha, a fact that local residents contrasted with the scant support provided by the government of then President Alan García. So it is understandable that reactions to the Venezuelan president during his tenure were more conflicting in Peru than other Latin-American countries. Most of the political class, except on the left, did not sympathize with his ideas. Neither was he a favourite in journalistic circles, with the same exceptions. But the response to his death in the blogosphere has been more moderate. Equivocado o no pretendió, ser el aglutinador de una América Latina en torno a si mismo y a una “Revolución Bolivariana” en la cual los intelectuales e historiadores peruanos no creen ni aprueban. Es más, muchos, en el Perú, creen que Simón Bolívar fue nefasto para los intereses peruanos […] El Perú de Ollanta Humala (y de Nadine [esposa de Humala]), felizmente que se distanció de Venezuela y la infiltración de las casas ALBA. Somos Libres. Rightly or wrongly, he tried to bring Latin America together, binding it to him in a Bolivarian-style revolution that Peruvian intellectuals and historians neither believed in nor supported. Moreover, many in Peru think Simón Bolívar was detrimental to Peruvian interests […] Happily, the Peru of Ollanta Humala (and his wife Nadine) distanced itself from Venezuela and meddling by the casas ALBA. We are free. Algunos medios de comunicación no querrán acordarse, pero Humala no es el aliado principal de Hugo Chávez en nuestra historia política, sino Fujimori. El manto autoritario hermana al Perú de la década de 1990 con la Venezuela de los últimos años. Some of the media may not wish to remember that it is not Humala who is Hugo Chavez's main ally in our political history, but rather Fujimori. The corresponding mantle of Peruvian authoritarianism in the 1990s is Venezuela in the last few years. lo que vi, nunca me gustó. La extrema descomposición social de uno de los países no solo entre los más ricos del continente sino con una renta petrolera envidiable. Vi la degradación de la vida venezolana en medio del esplendor de sus clases medias, ciegas a la pobreza de los cerritos y al desamparo de los pobres en medio de ricos que no merecían sus fortunas. Hasta que pasó lo que pasó. Llegó Chávez. “Llegó el llanero, no tan solitario, y se va a quedar un buen rato, tiene apenas 50 años, y va a revertir los dividendos petroleros hacia abajo. El método puede no convencernos, pero es lo que ocurre en países rentistas, Venezuela hoy y Argentina ayer, cuando el egoísmo social deja crecer una masa enorme de excluidos. I never liked what I saw. The drastic breakdown of society in a country that was not just one of the richest on the continent but with enviable oil revenues. I saw the deterioration of life in Venezuela in the splendour of its middle classes, blind to the poverty in the nearby hills and to the helplessness of the poor in the midst of the wealthy who did not deserve their fortunes. Until what happened happened. Chávez arrived. “The lone ranger has come, only he isn't alone, and he is going to stay a while; he is barely 50, and he is going to make sure the oil dividends trickle down. We may not buy into his method, but that is what happens in rentier sates, Venezuela today and Argentina yesterday, when general selfishness allows a huge portion of people to live increasingly at the margins of society. No me gustó Chávez pero tampoco la Venezuela anterior a Chávez. Así de sencillo […]: “A Chávez lo auparon para otra cosa, para que corrigiera una democracia corrupta, pero se ha inventado esa « democracia directa », cuando toda la que se vuelva directa deja de serlo. No le gusta la palabra compromiso ni mediación, es decir, no sólo lo que a Venezuela le falta sino la esencia de toda política. Chávez es un político de la antipolítica, como lo fuera Fujimori. Lo llamaron para curar la peste y aportó el cólera. Pero, aun así, nadie lleva por completo razón, ni la oposición ni las bases chavistas, cada una con su ulcerada y parcial verdad venezolana. I didn't like Chávez, or Venezuela before Chávez. It's that simple […] “Chávez was elevated for other reasons, so he would fix a corrupt democracy; instead he invented that ‘direct democracy’, where in becoming so direct, it became less democratic. He doesn't like the words obligation or mediation, something not just missing from Venezuela but that is the essence of all politics. Chávez is an anti-politics politician, as was Fujimori. They called him in to cure the plague, and he brought cholera. Even so, nobody is 100 percent right, not the opposition, not the Chavista base, each one suffering their own Venezuelan ulcerating half-truth. But beyond all these opinions, Peru was respectful in the wake of Chávez's death. The congress observed a minute of silence in his memory, although not without objection [en] by those who considered him a dictator. Outside the Venezuelan embassy in Lima, sympathizers arrived to express their condolences and pay hommage. 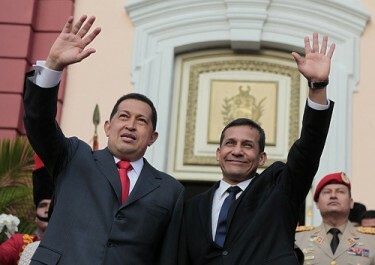 The government, for its part, declared [en] three days of national mourning, and Presidente Humala led a delegation that travelled to Caracas [en] for the funeral [en] of President Chávez. Meanwhile, the mayor of the province of Chincha announced the construction of a bust in honour of the Venezuelan president. 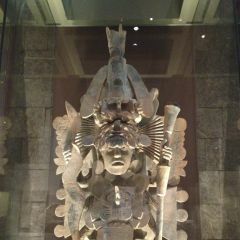 Post originally published on the blog Globalizado by Juan Arellano.